A photograph from the 1870s shows numbers 65 and 66 Marine Parade as two separate slim townhouses. They are long gone. A large single dwelling replaced the two of them, and a house on Wyndham Street behind, in 1932. Bright stucco made way for red bricks in an area that is nationally-renowned for its white and cream facades. I was intrigued to look around this most unique building. The owners, Bruce Gibson and Nasir Badshah, completed a major renovation of the building around five years ago that included restoration and reinvention in equal measures. The clay-tiled roof, and its ornate terracotta finials, are new. The double-glazed sash windows (which replaced inappropriate aluminium replacements) and their Bath Stone sills are new. The guttering (which has been uprated to zinc) and downpipes are new. A whole new house has even been added to the rear, fronting onto Wyndham Street, which works well as it fills what was an unwelcome gap. The generous front garden is where the sun is anyway. 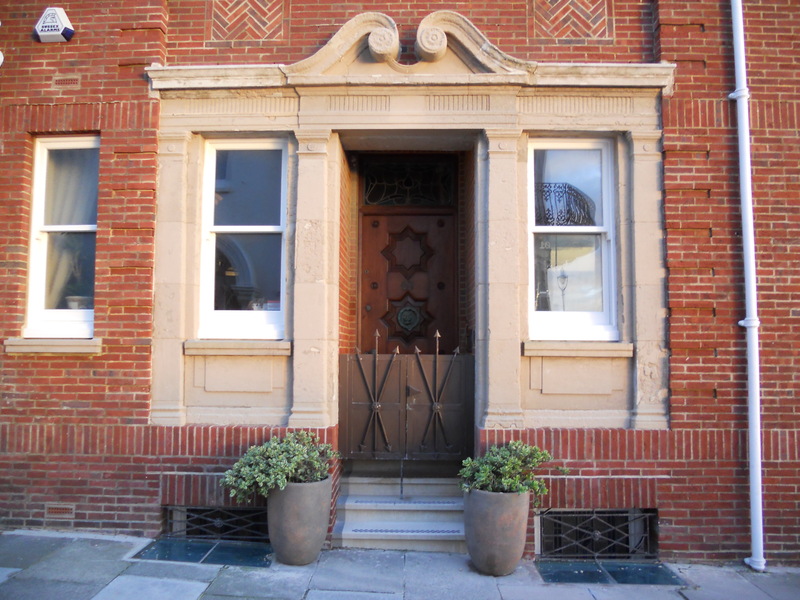 The front door is on the side of the building and is reached via a short flight of terrazzo steps with chequered inserts (similar to those throughout the Sussex Masonic Centre of 1928 on Queen’s Road). The layout is quirky as the rooms essentially wrap around an open central staircase. The ground and first floors lend themselves well to entertaining spaces. There is even a fully-ventilated smoking room. The second floor has bedrooms and an office. Best of all is the immense basement which features a massive bedroom, along with a luxurious travertine-clad sauna and hot tub complex. The house was the residence of Oliver Dalton who owned the Palace Pier and who was the namesake of Dalton’s Bastion which is where the Brighton Wheel is located. This is rather fitting as the eye is immediately drawn towards both the Pier and Wheel from most of the windows on the front and side of the building. Solid oak beams, floral fireplaces and mouldings, and medieval-style door furniture suggest Arts & Crafts as the building’s predominant style. Yet geometric brick patterns, a classically-inspired engaged portico with scrolled pediment and pilasters, and an elegant iron balcony suggest Art Deco. Single-pane sashes, of which this building has many, are famously Victorian. 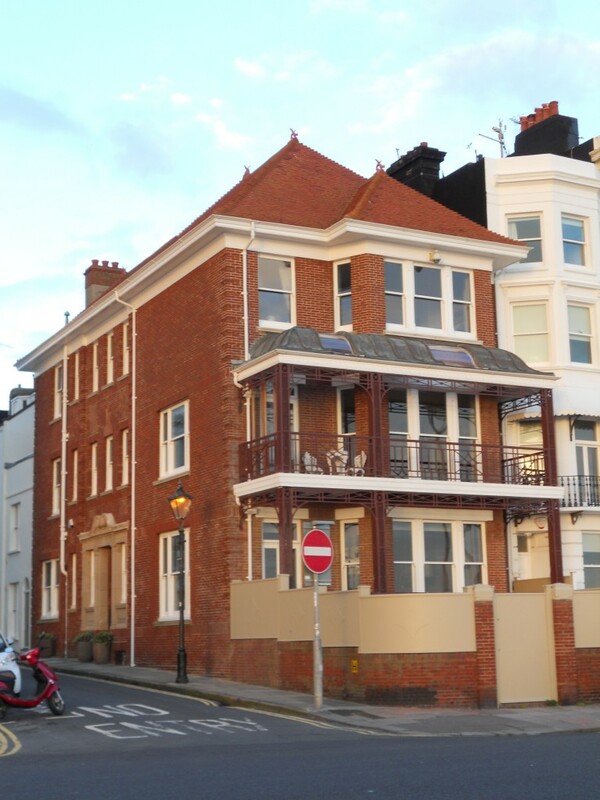 65 Marine Parade is a real mix of styles and it all adds up to one of the finest homes in Brighton & Hove.